On Sunday June 7th a friend and supporter of the Livingston Skate Park passed away. 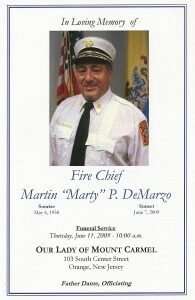 Marty DeMarzo was a member of the skate park committee and worked along with his family to make the park a reality. Members of HCHY and the skate park committee are deeply saddened by his passing. It was quite evident by the number of people who came to show their respects that we were not the only ones touched by Marty. His funeral was the biggest that I have ever attended. I remember the Skate Park meeting where Marty came marching into the room with this huge box of t-shirts that he had made up to raise money for the skate park. They are great shirts and every time I see one of the kids around town wearing one I will think of him. The one thing that stood out to me in the short time that I knew Marty was his passion for what he believed. There were a couple of times that he got very frustrated at the pace of the way things were moving with the building of the park. He got very excited and in no uncertain words voiced his opinion. I liked him immediately. I wish that I had gotten the chance to know him better. I know that his sons will feel his presence every time they ride the ramps at the skate park that will be built with the help of their dad. Here is a link to a Star Ledger Article.